You don’t need a lot of equipment to cook for one or for many, but good knives are necessary if you are going to cook efficiently and pleasurably. Whether you’re purchasing for yourself or looking for a gift for the cook in your life, knives make a gift that keeps on giving over and over and over. Many times, especially for small quantities, a knife is better than the food processor–especially since it’s so much easier and faster to clean. (But remember that knives are very personal in terms of how they feel to the user, so keep that receipt even if you’re giving the knives as a gift so that they can be exchanged if necessary). 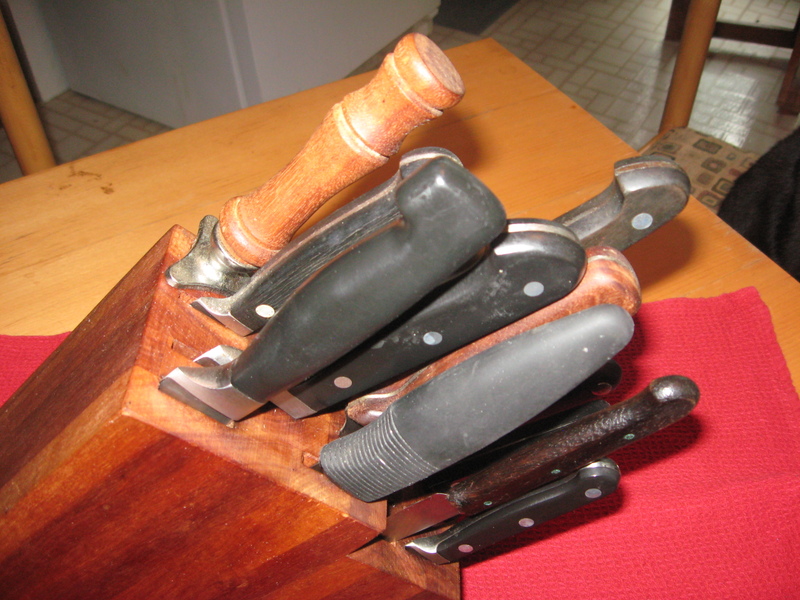 When you’re buying knives, you should know that the “set” of knives in a storage block may not be the best way to go. As with pots and pans, the sets are most likely devised by the vendor to get the most money out of your pocket and into theirs, without serious consideration of actual utility in the kitchen. Just as with your basic pots and pans, I would advocate purchasing knives à la carte rather than in a set since most sets do not have the most useful selection of knives and can be expensive. The knives that you see here are ones that I’ve collected over many years of cooking, both at home and in restaurants. As you can see, it’s not a matched set! The latest issue of Cook’s Illustrated (November & December 2011, pp. 25-27) evaluated knife sets for quality and usefulness. If you’re thinking of buying knives (for yourself or as a gift) I’d recommend taking a look at this article. You shouldn’t just shop the “celebrity” knives since (just like celebrity cookware) many of those just aren’t really the best knives you can get. 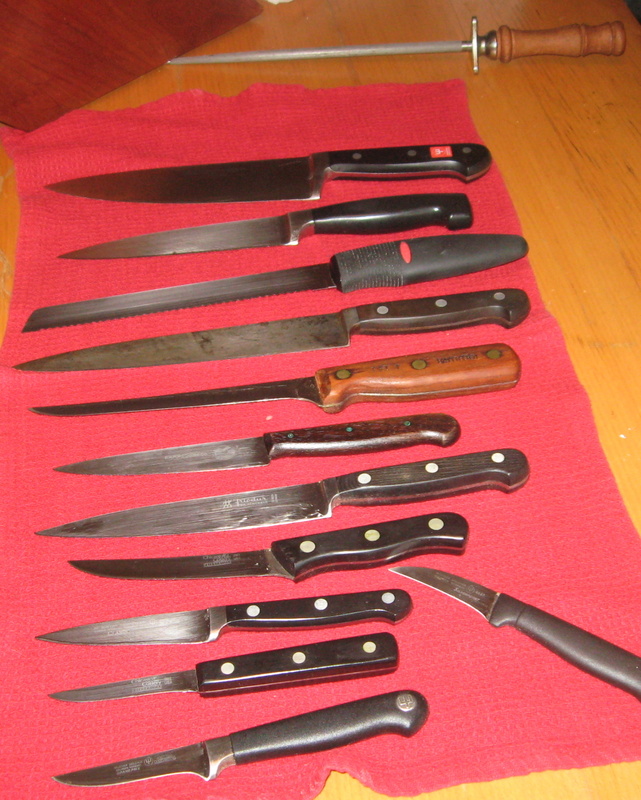 This article covers the basic knives that make up a functional set for most kitchen jobs. I’ve collected mine independently but I find that my selections are very close to those in this article. Chef’s knives are the workhorses of the kitchen–the knife that you’ll reach for most often. I have two: an 8-inch and a 6-inch. The 8-inch is large enough to handle that butternut squash or head of cabbage, and the six-inch handles smaller jobs. The eight-inch is a Wüsthof classic model. I like this for tougher jobs as it’s a heavy knife. The 6-inch is a Zwilling J.A. 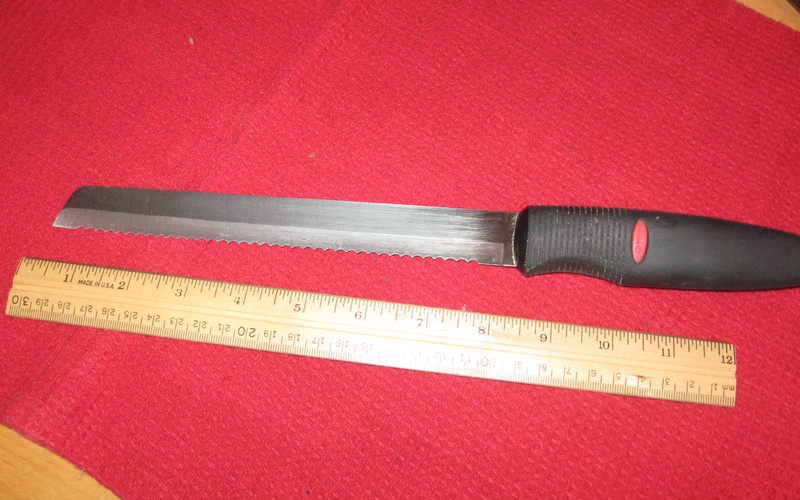 Henckels knife. It’s lighter than the Wüsthof and works well for lighter chopping jobs. 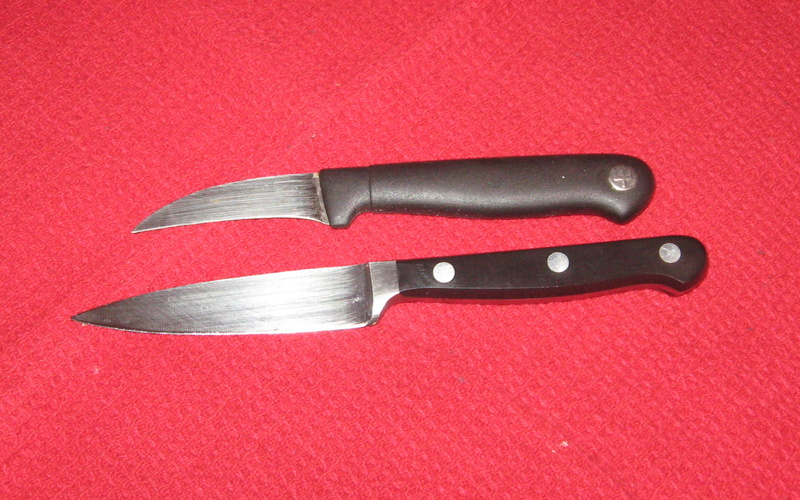 I don’t use these (even the heavier Wüsthof for dismembering poultry or attacking bones as that’s hard on the edges and I want these to stay sharp–I use heavy duty scissors or a cleaver. Another real necessity for the kitchen is a good paring (peeling) knife with a 3-1/2- to 4-inch blade. I’ve also added a Wüsthof bird’s beak paring knife that I find very comfortable for peeling jobs where an Oxo vegetable peeler won’t do the job. The bird’s beak is light and very comfortable to use for shaping, or peeling small curvy things. A slicing knife has a thinner blade that is more flexible for carving that bird or roast, or smoked salmon or salami. 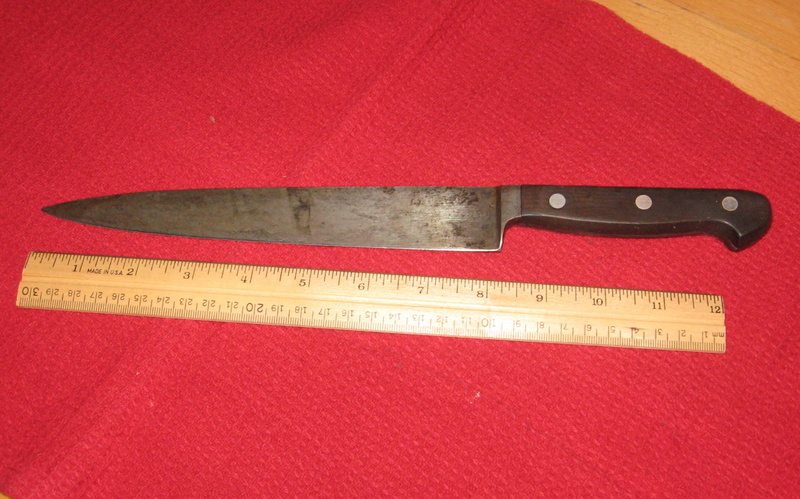 This is a carbon steel one that has been with me for many years. I use it for tomatoes and bread as well. Were I to replace it now, I would get a 10- or 12-inch blade as this is just a bit too short to easily use on a free-form boule. If you buy unsliced bread (or bake your own) you might want a bread knife–I do have one, although the slicing knife is often the one that gets used even for artisan style breads. While the Cook’s Illustrated tests recommended the Wüsthof classic 10-inch bread knife, I have an Oxo bread knife that I’m satisfied with–not that I wouldn’t love to have the Wüsthof bread knife, but my budget doesn’t stretch that far for a bread knife (but did for the chef’s knives and paring knives since they get used so much). 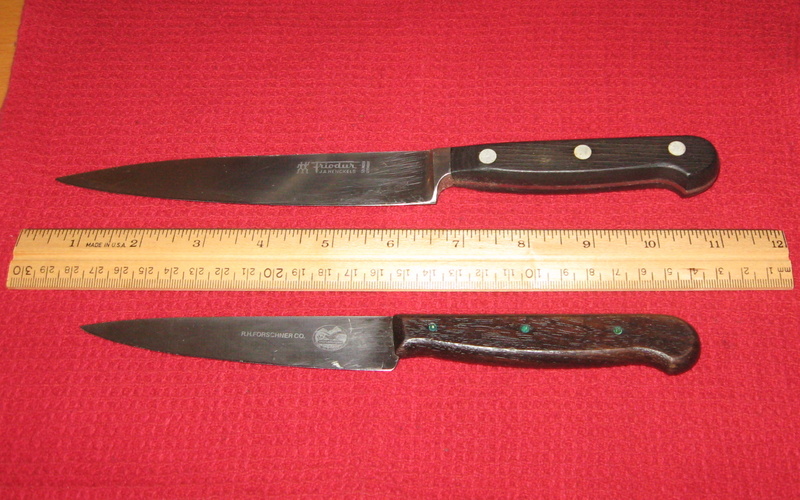 With almost all knife sets you find something called a “utility” knife–sometimes serrated, sometimes not. 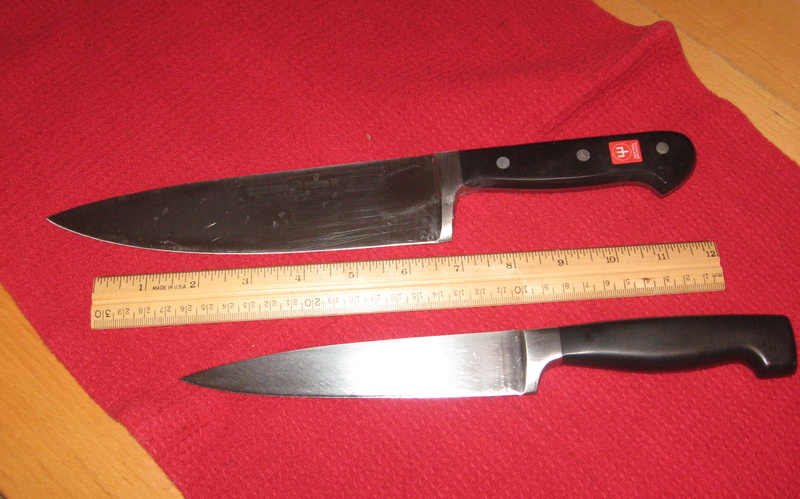 These are not the kitchen workhorses that the chef’s and paring knives are. 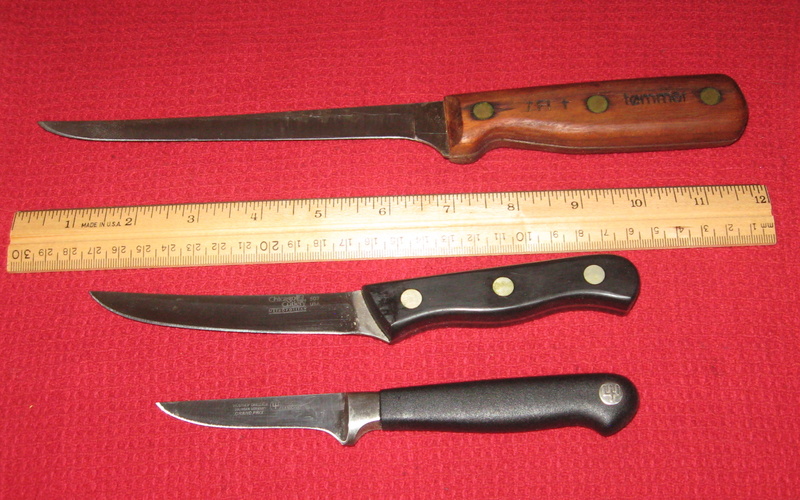 Over the years, I’ve acquired two–one Victorinox/Forschner and one Henckels Friodur cutlery. They don’t get used very often though they are nice to have around, but by no means essentials. I’ll sometimes reach for these when I’m slicing smaller tomatoes, or meats since they also have thin blades similar to the slicing knife. The other knives that I’ve added are a boning and fillet knives. The 6-inch and the 4-inch boning knives, with the sturdy blade, and pointed tip let you work around joints and bones easily. The 4-inch one gets a lot of use for boning chicken thighs (a staple in my chicken use). The fillet knife (Sabatier) with the slender, flexible blade makes taking the skin off a piece of fish a breeze. A steel is good to have, so long as you learn to use it properly, and realize that it does not sharpen your knives…it merely hones or realigns the edges. For sharpening you can use a stone if you’re comfortable with that, or a knife sharpener if you want to do it yourself…or have your knives sharpened by a professional. You do need to keep knives sharp–otherwise they are frustrating, and dangerous. With proper care, your knives will last a lifetime: they should NOT be put in the dishwasher, but hand washed, rinsed with very hot water, and dried immediately after use. You should store them in a block or on a magnetic holder to protect the blades (and fingers). Cook’s Illustrated testing recommendation was an à la carte set, including a storage block, which resembles what I’ve described above (without the fillet and second boning knife) which can ring in at about $334. If you want to do less searching and pick up a set, then the Victorinox 7-piece set is a good bet–for around $189. I’ve used the Victorinox knives and given price and functionality, they would be my choice for a set or as “best buy” in terms of the most bang for the buck. Whether it’s a gift for yourself or someone else, I’d recommend checking that review keeping in mind that Cook’s Illustrated does not accept advertising, and they do not accept products for review from manufacturers, nor do manufacturers get any notice that their products are being tested until the results are published. I think other website owners should take this web site as an model – very clean and great style and design, as well as the content. You are an expert in this area! I bookmarked your page: https://a-single-serving.com/2011/10/11/kitchen-knives/ and will check back often. Thanks for the awesome article! Excellent goods from you, man. I have understand your stuff previous to and you’re just too magnificent. I actually like what you have acquired here, certainly like what you are stating and the way in which you say it. You make it entertaining and you still take care of to keep it wise. I cant wait to read far more from you. This is actually a terrific site.